About 650 jobs will remain at the Kent research and development facility of the pharmaceutical giant Pfizer - 300 more than previously announced. It has emerged that about 800 staff have already left their posts at the Sandwich Discovery Park, with a further 700 still to go by the end of 2012. The company said a further 250 staff had moved to other UK sites. Pfizer announced in February that its operation, which employs 2,400 people, would close. A total of about 1,500 staff will have been made redundant and about 900 staff retained by the end of the process. A consultation process on the proposals formally ended on Thursday. Kent County Council said the site offered an opportunity for new pharmaceutical, "cleantech" and hi-tech research and development companies to start up. 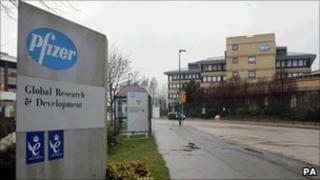 In June Pfizer announced it would retain some operations at its research and development facility. The company said it would continue its phased exit of the remainder of the site, on Ramsgate Road, by 2012 and it would review the retained operation within a few years as part of its business planning. Dr Annette Doherty, head of research and site leader, said the jobs to be retained in Sandwich were "critical functions" for the research and development of projects. "We hope there will be many other scientific companies that are also here with us and that there's a diverse set of businesses here at Discovery Park in the future." She added that staff would be located in three different buildings on the site, which would be leased from the future owner. "Pfizer has made the decision to remain here for the future."